Donatello (at the age of twelve) reads to his brothers and Splinter from a history textbook chronicling the rise of New York. He tells them about explorers such as Giovanni Da Verrazano and Henry Hudson, who interacted with the indigenous people of the New World and, in most cases, abused them. 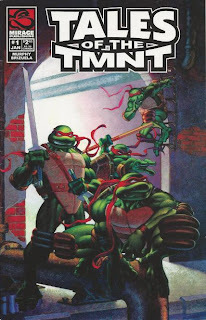 While Mikey is enthralled by the tale, Raph finds it boring and knocks the tome out of Don’s hand. A hidden map then comes fluttering out of the ancient text (which Don found discarded in the sewer). The map is an old guide to the New York City underground system, leading to a subterranean freshwater spring. Anxious to get some time alone and go exploring, the Turtles ask if they can follow the map and look for the spring, so long as they bring a modern map with them to keep from getting lost. Reluctantly, Splinter lets his pre-teen sons have their first overnight adventure without supervision. Initially, Mikey acts as navigator through the modern sewer tunnels, but that naturally leads to a dead end as he reads the map upside down. Leo takes command and their mission finds greater success. The years peel away as they travel through the forgotten depths of the sewer, encountering old subway car graveyards, ruins of an aqueduct system and even a bizarre series of manmade secret passages, the origin of which they cannot determine. Eventually, they happen upon the remains of a Dutch settlement and decide to camp there for the night. Before hitting the sack, Don reads more from the book, describing the ultimate fates of Henry Hudson and Da Verrazano. Apparently, Hudson later attempted a polar expedition but was met with mutiny by his crew. He and his son were left adrift in a lifeboat to die of exposure. Da Verrazano had it worse, landing on a Caribbean island and becoming the meal of cannibals. Mike is grossed out by the story, though Don finds the ultimate comeuppance of the explorers “Darwinian”. Raph feigns to be uninterested in history, but after everyone dozes off, he finds and pockets an arrowhead out of curiosity. The next day, the Turtles continue their journey through a series of caves. After happening on some fossilized dinosaur tracks, they spy a hand-carved tunnel and decide to take a shortcut. This leads them to an elaborate city of massive architecture, carved directly from the rock-itself. They have no idea who built the sprawling, forgotten city, but their attention is soon distracted by the discovery of the hidden spring. As Leo, Raph and Mikey go swimming, Don decides to do some chemical tests on the water and see if it’s safe or not. Only minutes after they begin playing, however, the pre-teen Turtles are met by the city’s inhabitants: half-worm, half-man creatures. 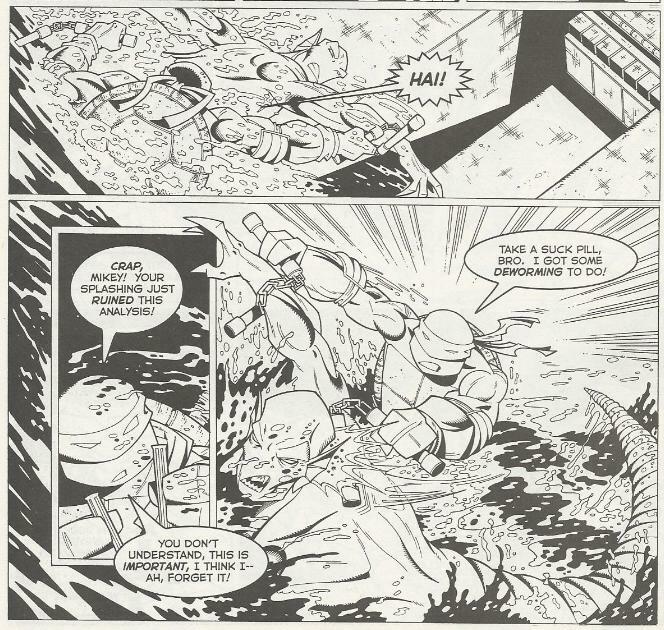 Startled, the Turtles engage the worms in battle, though Don opts to sit the altercation out and continue his tests. The worms put up a good fight and the battle rages for a while, until Don finishes his tests and yells for everyone to clear out of the pool. Apparently, the water contains deadly levels of lead and cadmium; the contamination poisoning the worm-people. Don unpacks the water filters they brought along and teaches the worm-people how to use them to clean their water. The Turtles then leave the somewhat confused worms behind, promising to check up on them in a few months to see how they’re doing. Recalling the adventure some years later, Don admits that they never did go back to see how the worm-people held up. In fact, now older and wiser, he scoffs at his youthful naiveté. He ponders that maybe the worm-people actually needed the lead and cadmium levels to survive or that maybe they’d already adapted to the change in their environment. As a seagull flies over the modern day New York skyline, Don concludes that things change and to survive you have to change with it. *This story takes place when the Turtles are 12 years old, meaning it predates TMNT (Vol. 1) #1. However, since the Turtles are no longer wearing their skullcap banadanas, it has to take place after TMNT (Vol. 1) #9. *Don claims that the story takes place during the centennial of Darwin’s “The Formation of Vegetable Mould through the Action of Worms”. As that book was published in 1881, that would naturally place this story in 1981. *Ancient, forgotten levels of the New York underground would go on to appear in Tales of the TMNT (Vol. 1) #6 and Donatello: The Brain Thief #4. Tales of the TMNT Vol. 2, I both love and hate thee. I was surprised when this book was originally announced, as Mirage’s TMNT releases in the early 2000s had been so slim I wasn’t expecting a second title. 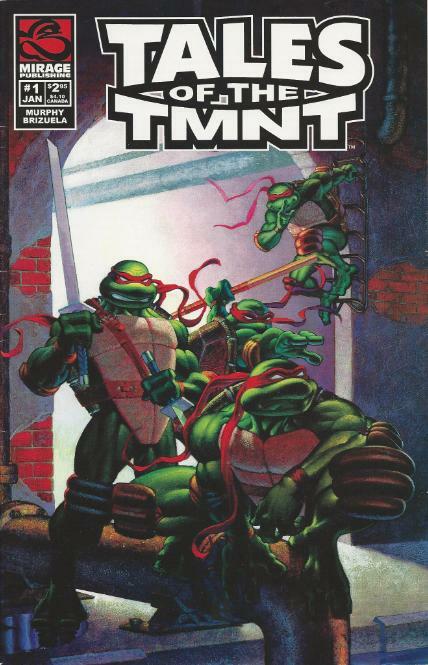 Ultimately, it was a good thing that they started this series up when they did, as the “main” book, TMNT Vol. 4, would very quickly meet with delays and ultimately an indefinite hiatus that has spanned years. Tales Vol. 2 kept the lights on for quite some time, becoming the second longest TMNT comic ever published (falling short of TMNT Adventures by just two issues) and offering a bevy of superb Turtle stories. Of course, some of them also kind of sucked and trying to work out the timeline of these installments (which take place all over the continuity) would be a headache, but Tales Vol. 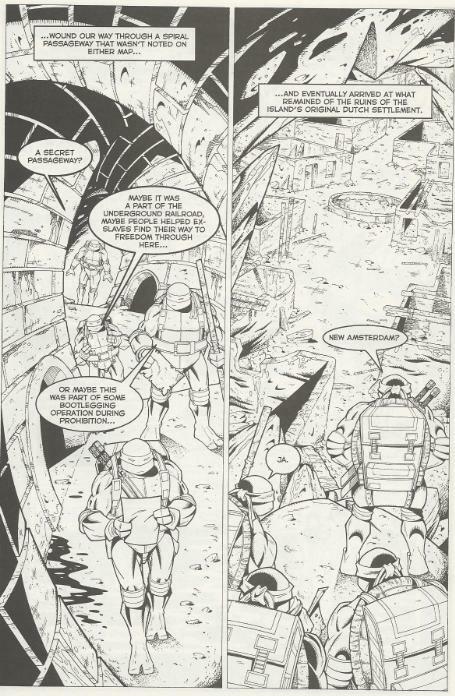 2 still offered a lot to the mythology of the franchise and it was satisfying to get a Mirage-published TMNT book every month for over half a decade. The opening editorial by Peter Laird is basically a mission statement for the Tales revival, explaining that its goal was to fill in the 15 year gap between Mirage’s TMNT Vol. 2 and TMNT Vol. 4 (Image’s TMNT Vol. 3 having been stricken from canon by Laird’s hand). 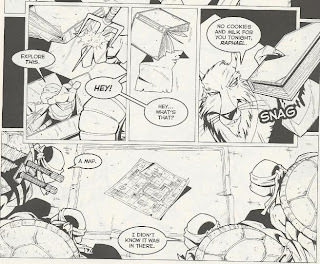 Odd, then, that this first offering doesn’t take place in that timeframe, but predates TMNT Vol. 1 by three years. Steve Murphy offers a flashback story that feels like it could have fit right in with the similar tales woven in his earlier series, TMNT Adventures (which he wrote under the pseudonym “Dean Clarrain”). It feels excessively “Murphy”, as it dwells on educational topics, points out environmental changes and the folly of man’s meddling and, of course, features American Indians both in historical guise and as ciphers via the worm-people. “Not Forgotten” is pretty much loaded with Murphy-isms from start to finish, though not exactly the worse for it. While it certainly struggles to impart a lesson on the audience, using the Turtles and worm-people as analogues for ancient explorers and Native Americans, and showcasing their irrational hostilities and Don’s meddling with their ecosystem to drive the point home, “Not Forgotten” seems a bit more evenhanded with its message than most Murphy stories of the same ilk. Don’s final words are more condemning of the indigenous people done in by the explorers, claiming that change is inevitable and Darwin’s theory about adaptation and evolution are natural laws that must be followed. In a way, it’s rather refreshing and shows how Murphy’s idealism has changed a bit since his TMNT Adventures days (when he used every opportunity to romanticize the utopian perfection of the American Indians and condemn the villainous evildoing of the European explorers and invaders). My favorite aspect of this story, however, isn’t the message it tries to deliver or the more action-oriented fight with the worm-people. It’s the montage where the Turtles travel through the sewers and break through the wall of modern architecture and start going “back in time”, layer by layer. I’ve always been fascinated by the idea of vast, subterranean cities and worlds built over by modern cities and the scene where the Turtles travel through several strange sectors that gradually get older and older as they move along is just marvelous (if the host hadn’t been such a colossal tool, “Cities of the Underworld” on the History Channel might have been one of my favorite shows). Bringing that part of the issue to life is Dario Brizuela. Brizuela will go on to be one of the more prominent artists in Tales Vol. 2 and one of my all-time favorites. This issue was my introduction to his style (he’d later go on to pencil IDW’s “Transformers Animated” comic) and it really invokes a more fun and carefree atmosphere, ala TMNT Adventures, that makes for a welcomed diversion from the “grim and gritty”. He’s very reminiscent of Chris Allan, I think; infusing expressive cartooning with a strong sense of action and adventure. Brizuela is especially talented at angles and “camera work”; keeping the layouts (in this issue provided by Jim Lawson) from looking flat and offering the illusion of depth that draws you into the underground worlds the Turtles explore. Most of this issue is nothing but talking, so Brizuela does his level best to make the pages as elaborate as possible and grip your attention. Quite frankly, had another artist handled the pencils on “Not Forgotten”, I’d likely have found it to be far more boring. The end result of “Not Forgotten”, unfortunately, is a tale that’s rather easily forgotten. Though the events leave a lasting impact on Don’s character, nothing that occurs here is ever referenced as significant ever again. Well, Don luring the Brain Thief down to a forgotten underground chamber at the conclusion of “Donatello: The Brain Thief” may have been a throwback to the tunnels he discovered in this issue, or it may just be a coincidence. Anyhow, artwork and my personal fascination with underground cities aside, “Not Forgotten” just doesn’t make much of an impression. And neither does the next issue of Tales Vol. 2, either. It really isn’t until Tales of the TMNT #3 that this title started gearing up and got me excited for each subsequent issue, even if the quality tended to fluctuate from time to time. I noticed that your Mirage timeline doesn't have a link to this review yet. Hopefully you fix that soon. I like the artwork in this one, but my eyes had a real hard time reading this one. Everything is just black lines over bright white spaces, there is no shading or tones on anything (with the exception of a few black shadows and backgrounds). Brizuela's art is very busy and he does a lot of work with his backgrounds and panels, so it makes everything very hard to follow. And of course all these long-forgotten subterranean passages are adequately lit and have plenty of ventilation for campfire smoke and toxic gases, but for some reason you still need campfires at night because it's nighttime. Underground. ...Really, I find all these particular breaks from reality forgivable, but it's still unexpectedly amusing when you realize not one of them is carrying a flashlight.